Not a whole lot going on here just working on all the Fish still. 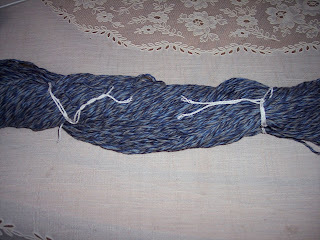 I'm needing to go get more yarn for this project as I have went through two skeins already. So far I have 24 Fish it's coming along Swimmingly (LOL). I'm also working on a Birthday gift for my Mother and my Niece Betty Spaghetti (I call her this be cause she's all wiggly and skinny). For my mom I am making a Afghan Blanket in Plum Purple and Ivory. I am using one of those light up hooks (which are awesome) in H. I'm just making a regular granny square. It's coming along pretty great. The other project is for my Niece Betty Spaghetti is a crochet bunny. I am making the pattern up as I go along and I am only at the head but so far I like it. I'll post pictures when I get more done on her. I think I am going to name her Bonnie. Bonnie the Bunny. I plan to make her a bunch of little stuff to play with also. On another note. I received a wonderful surprise last week aand I am so moved at the caring of others. I was picked as a receiver for a Random Act of Kindness for Karma Swap on Ravelry by Madcraftermom on there, and I got this in the mail. It's a beautiful 100% Cotton 300Yd. In a really pretty blue and gray mix. I really like it and I am not sure what to make out of it yet but it will probably be a scarf. 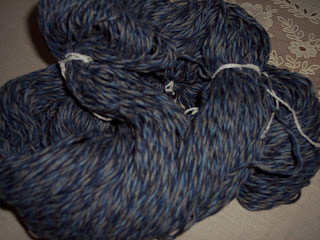 I also received a secret RAK from Pichincha on Ravelry. 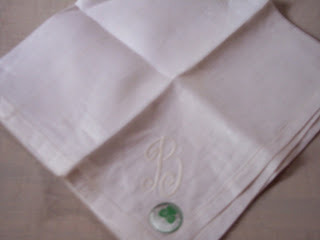 It's a gorgeous Linen Handkerchief with the initial B on it. 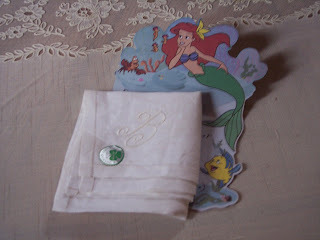 It has a sticker that states it Irish Linen. I love old things. I like knowing that something has a history to it and can be passed to other's for their enjoyment or use. I have never owned a Handkerchief and this one will be treasured always. I love surprises and gifts and when I receive something that someone put thought into just for me I feel moved and humble to be cared for.